Realize STP with automated trade uploads to an order management system. Eliminate re-keying of data and manual-entry errors. Create proposed trade lists by rebalancing accounts to models and/or other accounts on the system. Rebalance portfolios to match targets by asset class, asset subclass, equity holdings, and sector. Monitor pre-trade transactions to ensure compliance with buy/sell lists. Monitor portfolio risk and optimize portfolios to models with minimal turnover and capital gains. Make the best trades at each optimization opportunity to optimize tracking to the client’s strategy. Rebalance thousands of taxable portfolios in a fraction of the time required by traditional means. InvestEdge includes reliable, easy-to-use features for automating virtually all aspects of account rebalancing, trade analysis, and order placement. Thanks to an alliance with Northfield Information Systems, InvestEdge also provides front office advisors with tools for intelligently managing equity portfolios for tax-sensitive HNW and UHNW clients. Through a single interface, you can quickly produce tax efficient buy/sell lists, compare potential trades to restricted holdings lists, evaluate the impact of transactions on the portfolio, and release trades to a third party order management system. To start, InvestEdge includes many options for generating proposed trade lists. For example, portfolios can be automatically rebalanced to mirror a model portfolio or any other account on the system. Upon request, InvestEdge compares a portfolio’s holdings to a target, and produces recommendations. If a transaction is suggested but not desired, it can easily be excluded. Once executed, the account will match every holding in the model on a pro-rata basis. Portfolios can also be rebalanced to match targets by asset class, asset subclass, equity holdings, and sector. In instances where rebalancing is not required, transactions can be input directly into the system. Meanwhile, the combination of InvestEdge and Northfield simplifies the management of tax-sensitive portfolios. 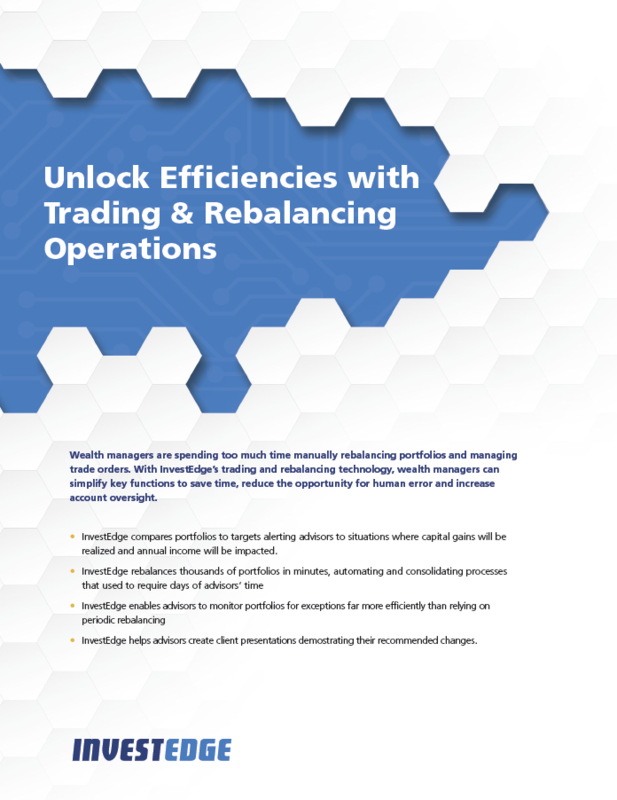 Unlike traditional portfolio optimization approaches-which are typically manual, ad hoc, and error prone-the system arms you with automated tools for monitoring portfolio risk and optimizing portfolios to models with minimal turnover and capital gains. By introducing optimization into the workflow of advisors, portfolio optimization is accessible to those who know clients best, it is no longer the exclusive domain of quantitative analysts and investment strategists. The system automatically recommends the best possible trades based on customizable risk and tax-based constraints for each situation. 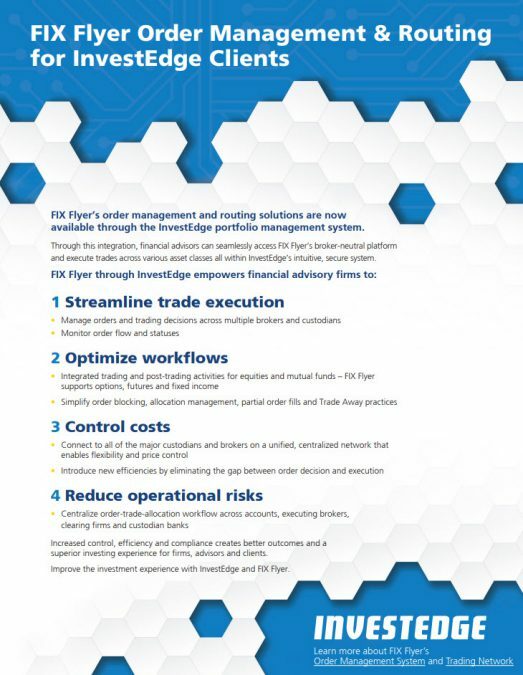 InvestEdge also has a partnership with FIX Flyer to add order management and routing to its portfolio management system via the Flyer Trading Network and Order Management System. Flyer’s trade management system is a broker-neutral platform designed to optimize workflows and reduce operational risks at the organizational level by automating and centralizing trading and post trade processing. Flyer Trading Network manages connections to all of the major custodians and brokers with a unified advisor facing API and tailored workflows for wealth management for equities, mutual funds, options, futures and fixed income. Financial advisors gain significant efficiencies by eliminating the gap between order decision and execution. Advisors gain additional efficiency in managing orders and trading decisions across multiple brokers, custodians and strategies. As a result, firms benefit from advanced risk monitoring tools for measuring equity portfolio drift. The system compares portfolios to targets using sophisticated algorithms, alerting advisors to situations where re-optimization might be required. Continuous portfolio monitoring enables advisors to track portfolios far more efficiently than older methods which rely on random reviews or periodic rebalancing. Firms also gain substantial improvements in efficiency and scalability-thousands of taxable portfolios can be rebalanced in a fraction of the time required by traditional means. Advisors are also better able to demonstrate changes in portfolio tracking error, utility, etc. to show the overall effects of recommended changes. Meanwhile, clients benefit from tax-wise accounts that more closely mirror their objectives.